HEADSHOTS, PEOPLE! Please update your headshots. As we are coming to a close for the 40 Most Inspiring Leaders in Sales Lead Management nominations, once again it's time for me to RANT! What the heck is wrong with you folks using your head shots from parties, cropped from trade events, vacation photos that are fuzzy at best or so old that it was three "yous" ago? You all need GOOD headshots. I've run across some that I've been using for the nominees for over seven years. Some have one headshot on LinkedIn, one on the website team page, another on Twitter and another on Google+ - BE CONSISTENT, please. Go for higher res. Some of you have actually SCANNED a printed photo from a studio - I can tell because there is lint on it and that "distance" from the glass. Toss this task to marketing, your PR team, your INTERN - someone. I'm using what I find and a few of you may not be pleased. I go by LinkedIn first unless they are terrible. Then, I check your site. If that is equally terrible, I close my eyes and pick one. The 7 Most Important Words that a CEO Can Say! 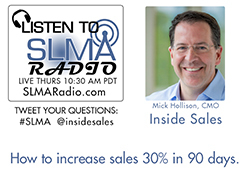 The seven most important words that a CEO can say is, "Follow-up 100% on all sales leads!" Sales, the prospecting is fundamentally a marketing activity, right. If you have your salespeople out marketing, they're trying to create interest in the product. That's a marketing – you're only doing that because – hopefully you're only doing that because you're not getting a substantial enough flow of leads into the – good quality leads into the company. So you're doing it by necessity. They've gotta follow up leads, they've gotta make quota and they've gotta fill out their expense reports. And only two of those are really mandatory. The third one – the first one, if you have 100 percent follow up of the sales leads you'll be doing three to four times better than your competitors. Who's going to win? Listen While You Work: Author Carlos Hidalgo Tells Us Why Marketing is Under Such Stress (and what to do about it)! THe SLMA Book Reviews are interviews with the authors on SLMA Radio and our assessment of the book. Endorsements by Craig Rosenberg, Chief Analyst, TOPO; Jesse Noyes, VP of Product Marketing, Content & Communications, Kapost; Adrath Albee, author Digital Relevance, Developing Content and Strategies that Drive Results; Jon Miller, CEO and Co-Founder, Engagio. The first chapter, The Issues with Modern Demand Generation lays it out beyond the simple statement that 70% of the decision making is done by the time a buyer talks to a rep. Adapting the Lead Generation Process and Measuring for Success I found to be especially helpful. I also liked the Demand Process Glossary. Depending on your role in marketing you will find the chapters that pertain to you. Carlos is an innovative thought-leader with over 20 years’ experience as a B2B marketing practitioner and industry visionary. Carlos is widely recognized for his expertise in strategic integrated marketing, Demand Process, Demand Transformation℠ and marketing automation. As CEO and Principal of ANNUITAS, Carlos drives strategy and leads core practice teams to Transform Demand℠ for enterprise clients globally. Carlos has been named one of the 50 Most Influential People in Sales Lead Management for the last five years. Disclaimer: Annuitas is an SLMA Hi-Visibility Sponsor. Matt Heinz answers the show's benchmark question: "When you absolutely must break through to someone of great importance, someone who is impossible to reach, how do you do it?" Dispelling Myths about Millennials: Why would they come and stay? Susan Finch SLMA Radio Host and her Guest, Jaysen Greenleaf, VP of Business Development at RIO Genesis Software discussed both sides of recruiting great talent for your team and retaining them. They also dispelled myths about millennials, including thinking they are job hoppers. In the first half of the show they discussed preparing for growth, where to find the talent and the value that younger team members can bring, especially fresh from college or another industry. They are a clean, tech-savvy, educated slate with strong entrepreneurial spirit. Do you know an Inspirational Leader In Sales Lead Management? SLMA CEO, Jim Obermayer, said “Inspirational leaders in sales lead management challenge the status quo and bring entrepreneurial thinking to software and web applications. An inspiring leader can be a department manager, an author, a speaker, a company president, an events manager, a communications specialist, or an innovative thinker in lead generation companies. He or she might work at an agency, a software company (CRM, marketing automation, business intelligence or artificial intelligence applications, telemarketing, etc. ), or one of the thousands of vendors serving the lead management discipline."